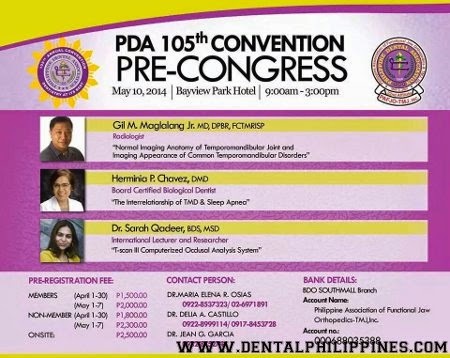 PAFJO-TMJ would like to invite you to PAFJO-TMJ, Inc. Seminar "Prosthodontics Consideration in TMJ Treatment"
2nd Topic: Revisiting the Basics- review of basic topics in prosthodontics while integrating the concepts of a stable temporomandibular joint position. 3rd Topic:Centric relations and occlusion in Finishing Prosthetic Restoration"
By: Adrian Carlos F. Manaloto, DMD, MSc. August 27,2014 at Crowne Plaza Hotel at 1 to 6PM. Members 1,500 Non-Members 1,600 Onsite 1,800. 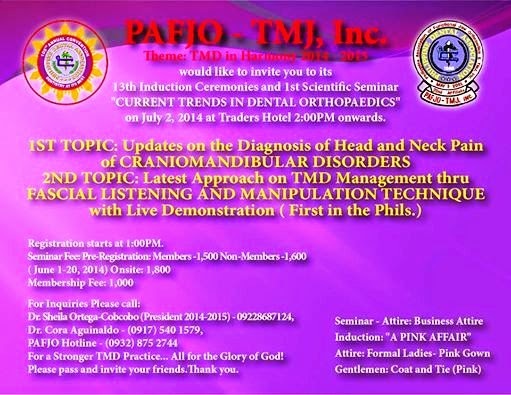 PAFJO- TMJ, Inc. would like to invite you to its 13th Induction Ceremonies and 1st Scientific Seminar "CURRENT TRENDS IN DENTAL ORTHOPAEDICS"
The Simplified Straight-wire Technique is a new technique develop by Dr. Messias Rodrigues which utilizes simple and easy mechanic in treating malocclussion especially extraction cases. The Emphasis in this Technique is the use of Light forces in closing extraction spaces without the use of intraoral or extraoral anchorages. Learn how to correct crowding,excessive overjet and overbite simultaneously with one simple mechanic. En massed retraction of anterior teeth using 2-3 ounce of force only. How to avoid unwanted movement and loss of anchorage.